VetUK Flea and Tick Treatment for Large Dogs is for the treatment of flea and tick infestations in large dogs weighing over 20kg. Each 2.68ml pipette contains 268mg of fipronil and is effective against fleas for up to 8 weeks and ticks for up to 4 weeks. Apply 1 pipette of 2.68ml to the base of your dog's neck ensuring it is directly in contact with the skin and is in an area your dog can't lick off. For dogs weighing over 40kg use 2 pipettes of 2.68ml. After seeing a special offer on this own brand flea/tick treatment on a deals site I decided to read some reviews. Bought some straight away! I personally buy own brand ibuprofen for my headaches rather than the brand "Nurofen" as they have the exact same active ingredient, so I figured that the own brand flea treatment would be no different. I was right! The delivery was quick and reliable, the product did exactly as it described and my 2 large boxer dogs didn't have any reactions.Using this product has saved us so much money, and as the dogs reacted positively to this, we are placing another order. I have used this treatment on my 2 dogs and it just fabulous wonderful product and my 2 dogs never reacted or had any reaction to being sick or anything and I will continue to buy this product it would be awesome if the price is a little lower. I am delighted with VetUK own brand products, excellent value for money and they work just the same as the well known brands but save me a small fortune! Very happy with service and product, I am a repeat customer and recommend these products to my pet owning friends. Used this as a much more economical product than the more well known brands.Has the same active ingredients (fipronil) keeps the dog flea free for 8 weeks! Very easy to administer. Does not smell as much as some other brands, which is obviously a plus. so much cheaper than others,but works ...flea free ! Clear Website, competitively priced products and prompt delivery. I am a regular user for my 3 greyhounds aged 13, 9 and 3! 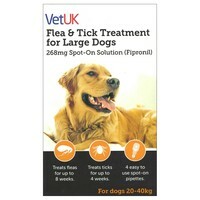 I used this for the first time last year, after hearing lots of reports of Frontline-d dogs still getting fleas! This is so much cheaper, but I found it works just as well. Happy to say I've never seen a flea on them. I've yet to see how effective the product is but the design of the pipettes seems a little odd. Half way down the tube there is some sort of restriction which made it difficult to get the liquid out and I think I got more on my hands than I did on the dogs. I expect it would be fine with a patient dog but when you've a dog that's a wriggler and you need to get it on fast, I struggled. Perhaps VetUK could look at the design? Great price for a great product that seems to have done the job so far so would certainly recommend it! My dog George hates car journeys especially to the vets so it's great that I can easily flea him in the comfort of his home for just a fraction of the price :) thanks!